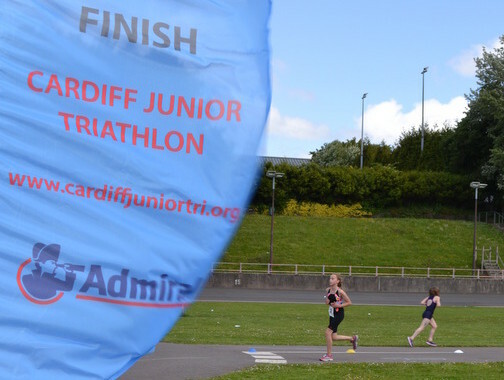 Saturday the 6th June saw the largest ever number of competitors fielded for the Cardiff Junior Triathlon since it first started almost a decade ago. Over 120 competitors along with their supporters travelled to the capital city battling in the Cardiff traffic with “One Direction” fans to get to Maindy Stadium where the event is annually held. There was strong support from the local Welsh junior clubs with Swansea Trisharks, Celtic Tri, Pembroke Tristars and Taff Ely Tri all turning up in strength as well as competitors travelling further afield from Ludlow, Dorset, Exeter and Somerset. Once again the weather was kind with the early morning drizzle clearing up after the Marshals had set up the transition area and course signage, just in time for the 12:30pm race briefing. Although being a bit windy by 1:00pm the sun was out in full and the Tristars kicked off the first wave. A very strong run from Isaac Beynon (Cardiff Junior Triathlon Club) saw him come from behind to take first place for the Tristart Boys in a time of 7:45, he was closely followed by Dewi Thomas (Pembrokeshire Tristars) 7:57 with George Townsend (Ludlow Junior Triathlon Club) in third with a time of 9:17. Cari Hughes (Celtri Tri) stormed ahead to take the Tristart girls first position with an impressive time of 07:52. Second and third places were closely contested with Gracie Gilligan (Swansea Trisharks) edging in front of Gwen Haf Jones (Taff Ely Tri) to take second place by a one second margin with times of 9:30 and 9:31 respectively. With 17 entries the competition for Tristar 1 boys was always going to be tough. Harrison Coppen took the first place honours in 13:19, followed by Gruff Rees 14:20 and Charlie Way close behind in 14:42. Tristar 1 girls followed with some equally competitive times with Eve Hickman (AIM2TRI) winning with a time of 14:35. Pembrokeshire Tri Clubs Amy and Eleanor White took second (14:51) and third (15:03) places respectively. The Tristar 2 category grows every year and this year saw 34 competitors battling for the top spots. Jensen Coppen matched his brothers T1 victory by taking first place in Tristar 2 boys (19:53). Only 10 seconds split second and third position with Liam Edwards (20:29) narrowly beating Alex Layzell (Celtic Tri) (20:39). Molly Reardon (Taff Ely Tri) came in first for the Tristar 2 girls with a fast (20:29) with Dorset Pentathletes Jessica Hudson taking second place (21:37) closely followed by Tia Froom (21:54). From the start the Tristar 3 category was going to be fiercely competitive and the spectators were not disappointed. Just 4 seconds split the top Tristar 3 boys positions with Nathaniel Harries (Celtic Tri) winning the sprint finish (27:58) against Joseph Reardon (Taff Ely Tri) (27:59) and Emyr Thomas (Newport Olympic CC) (28:02). Celtic Tri took first and second place honours for Tristar 3 girls with Eluned King winning with a time of (28:19) followed by Ocean Poultney-Maddy (28:33). Swansea Trisharks Layla Gibbins following in third (30:47). The last wave of the day contained a mixture of Youth / Junior girls and boys. Lewys John (Cardiff Junior Triathlon Club) led from a fast swim and took first position (39:27), second place went to Jack Skuse (40:33) and Seb Donnelly (Cardiff Junior Triathlon Club) took third place (43:22). Swansea Trisharks led the girls category with Sian Edwards taking first place in 46:38 followed by her club colleague Carys Lyall in second (48:00), in third was Lucy Bidwell (Cardiff Junior Triathlon Club) in a time of 51:04. Full results can be found on the Cardiff Junior Triathlon website (www.cardiffjuniortri.org). Cardiff Junior Triathlon Club would like to thank everyone who contributed to making this event such an enjoyable and successful day of races and look forward to welcoming everyone again next year!